I am absolutely loving having a baby around the holidays! Her wardrobe is getting bigger and better than mine by the second and the Christmas stuff that is out for her to wear, I am drooling over!!!! Here are some of our top picks! With Black Friday right around the corner, I will be on a spending freeze untiil then for sure! Old navy has 50% off their entire store for card holders and I am going to take advantage of Cyber Monday this year as well. I also have been eying these pans from JCP. 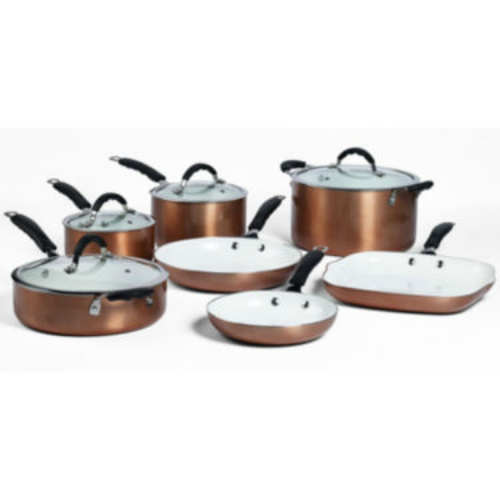 They are ceramic non-stick pans with copper outsides. They retail for $280 and are on sale for $79.00 on Black Friday! Those antlers and the cable onesie is too precious! Why did you have to tell me about the ON Sale???!!! I am trying to be good! The antlers to too cute!!! I love the buffalo leggings. I may want them for me. I just bought Jack a buffalo plaid winter coat. Can you those pans online? I've been eyeing copper ones too!